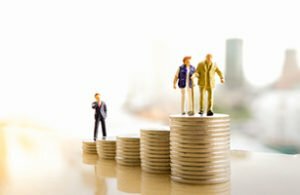 According to a recent report from the Government Accountability Office (GAO), the median retirement savings for Americans between age 55 and 64 was only $107,000. If you broke that down into monthly payments for 30 years, it only amounts to around $300 a month – a fraction of what you need to live comfortably. It gets even worse, too. The median retirement savings for all Americans is a meager $5,000. But it doesn't have to be this way, even if you're nearing retirement age. As the GAO's report suggests, millions of Americans are lagging far behind on meeting their retirement goals. According to a survey from GoBankingRates, one in three Americans have absolutely nothing saved for retirement at all. And according to a survey from the same firm, 42% of the nation's overall population has less than $10,000 put away for retirement. That's only 1% of the $1 million many experts recommend saving before you reach 65. That might sound like a huge number, but that's what you'll need. According to the Bureau of Labor Statistics, adults 65 and older spend an average of $45,000 a year. If you have $1 million in the bank at 65, you can expect to run out of cash after 22 years. That's just over the average retirement length of 18 years. And with the average life span increasing, it means you might even struggle to make ends meet. That's increasingly the case with many folks of retirement age who are struggling to stay afloat by relying on their nest egg. In the last 10 years, the number of seniors declaring bankruptcy has risen to over 7%. That's a 233% increase over senior bankruptcy levels in 1991. Now, many retirees tend to dismiss these concerns, saying that the money they've paid into social security should be enough to get them out of a tight corner. However, you shouldn't be so sure. Without significant reform, the Social Security Administration (SSA) estimates that it will need to cut social security payments by 23% by 2033. That means after the SSA runs out reserve cash, it will only be able to meet 77% of public demand for social security. And that's not going to do much to protect your bottom line if you haven't saved enough in advance. Plus, investing in the stock market alone might not be enough to fully fund a retirement plan anymore. According to Morningstar Investment Management, U.S. stocks are unlikely to yield more than a 1.8% annual return over the next 10 years. That's barely higher than the U.S. Federal Reserve's projected 10-year inflation rate of 1.73%. But you don't have to suffer, take on a second job, or keep working through your golden years. By mixing strategic trading into your investment plan, you can amplify your income and meet your retirement goals. And that's even if you've already retired, too.